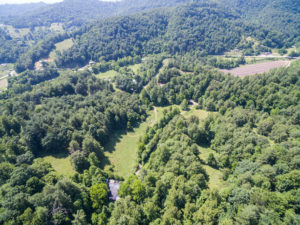 This new farm listing just north of Asheville is a beautiful spot for a family farm, retreat or bugout location. Its easy to reach, yet very private and rich in resources. There are more than 800′ of frontage on Sandy Mush Creek, plus there is a spring fed creek within the property itself. Approximately 11 acres of field and fenced pasture make it ideal for livestock. A 60′ greenhouse provides growing opportunities year round and the well cared for brick ranch house is tucked away and very comfortable. There are multiple building sites on the property if one chooses to build and there is a 14 stall barn. The barn will require substantial work to bring it up to par, but in its current condition, it provides a lot of storage space for equipment and materials. Just below the barn is a decorative lotus and lily pond sitting beside a bamboo grove. The grounds are dotted with numerous specimen trees from the garden supply business that has been operated out of the greenhouse for years. This is a special property at $649,900 a very good value relative to other lesser accessible or topographically challenged properties elsewhere when factoring the acres of field, creek frontage, house, greenhouse, etc. Call today for a private showing.